Mood disorder here (Bipolar I) and my anecdotal evidence suggests that Whole30 (after the initial moodiness) helps with overall mood stability. Even when coming off of it as long as I am cooking ahead and actually planning my meals instead of just eating whatever it seems to help. I have been eating one sweet potato a day pretty much every day. For the first week they were smallish (fist sized) but have moved up to about 1 1/2 fists now. I usually have them with dinner which is after spin class. They work pretty well as a ghee and balsamic vinegar delivery method. I am on day 12 here and the weekend was kind of rough but I made it through. Went on a rather hot hiking trip with the kids and the dog on Saturday. Ate a big breakfast (two green peppers, one onion, and three eggs cooked in ghee along with sausage), packed a snack (raw nuts, coconut, dates) and a steak for the ride back. We "only" did five miles, usually we do 8-10. but it was rather strenuous so it felt about right when it was all over. Things are going pretty well NSV wise as I am wearing pants that I haven't been able to fit into in a while and I have moved up one hole in the belt. Edited to add: I had what I would usually call a using dream last night (addict/alcoholic speak). In the dream I had a cheeseburger with very salty fries, when I woke up I was pretty discouraged until I realized it had been a dream. The privilege part is your assumption and in the case of my life, an incorrect assumption. I planned both this Whole30 and my work schedule carefully for this month. I'm glad to know I make it look easy. I know it's not, I know that from experience and that is why I share details of the meals I throw together and the fact that I put so much prep into this before the month started. Good afternoon everyone. So far my meals have been quick and simple. I had my remaining Scotch egg for breakfast, made green beans with a creamy dijon to go with it. Lunch was a simple burger with sauteed mushroom and onion on top of a bed of raw spinach, which quickly became semi-cooked from that. I had a serving of macadamia nuts with that but not mixed in with it all. Day 11 is almost over. I'm full from dinner. Made my Chicken Vegetable soup (with extra chicken) that I mentioned earlier. I normally would eat with some mini saltines, so I substituted avocado. I figured you put avocado in Chicken tortilla soup, so why not chicken vegetable? It was delicious. Pants felt a little easier to button this morning too. Looking forward to day 12. Oops, make that Day 12 is over - time is flying by! End of day 13 for me. I'm bloody proud of my self Too! I'm actually doing this!! great eating today, veggie omelette much like @Lizzards the other day. Even DH ate some of it. Added avocado. Lunch was tuna, eggs, whole30 Mayo, salad, cucumber, red capsicum and a madarine. Supper was steak, avocado, more salad and a kiwi fruit. my face is thinner and my clothes are looser. Sleeping like a baby. had a bit of the sads today, thinking about my mum, father and two other family members that passed and I had a cry...but I didn't go for comfort foods.,I allowed myself to have those tears and then I could move forward not taking that weight with me everywhere I go. That felt better than any comfort foods. Oh thanks @HopingtoHeal that makes sense. I am catching up with the posts. I think I may need to simplify my meals a bit. I feel all I've been doing for the past two weeks is cooking and cleaning. But the food has been delicious. I've been using Real Plans. The second day, June 2nd, we were stuck somewhere for a few hours. My husband decided that, for the first time in a long time, he'd like to sit at a restaurant bar and have some draft beer while we waited. He reconsidered because of me, but I told him I wasn't going to sit in a hole for 30 days or I wouldn't make it. So we sat there for three hours. Thank goodness for the Internet. While everyone around me was having cocktails and bar food, I found a compliant option (dry grilled steak & broccoli) and had club soda with lime & lemon. Usually I'd go for the nachos or wings (or both) and a martini or tequila. Now I know to call ahead to figure out compliant options ahead of time. Going out together is a big part of our newly empty nesting phase, do I can't take that away from us. My dad was admitted to the hospital yesterday two hours away from me. My mom is with him and my sister and brother are in the same city and have been taking care of him, and taking care of my mom. My mom and dad have both told me not to go yet until we know what's exactly wrong (still doing testing) but I have guilt, especially since I'm the only sibling without a job. If I go I'm going to do my best to stay on track. I'm assuming it's not going to be easy. I wish I were closer. The only other issue I've had is a few days ago I became very moody and I can't seem to get myself out of it. Every little problem that I have is blown up in my mind. None of these problems are worth losing sleep over, but they have me in an ugly funk. (But I am sleeping very well btw). So I hope this gray cloud lifts soon. It could also be hormone related. Day 13 ... here we go. Diet is on track. Looking forward to grilling some Copper River King Salmon fillets for dinner later. Breakfast, lunch, dinner similar yesterday. Eggs with veggies in the am, chicken avocado salad for lunch, and a grilled salmon with avocado, broccoli rabe and sauteed potatoes for dinner. Weirdly, been feeling a little bloated the last 2 days. Clothes definitely fit better, but not feeling as great as i did a few days ago. Sleep was also not great - woke up at 3:30am and was restless afterwards. Powering through. Thanks for all the recipes - this forum has been very helpful in that regard. From a Whole30 support group on Facebook the author of 30 Day Whole Food Challenge Slow Cooker - Kindle Review is offering a free download if you will be willing to write a review on Amazon. At that point you may request from her a Kindle download. I know we have a ton of recipes available to us, especially with all the support here, but I need a jumpstart of enthusiasm about food in general so have requested the free download. It has 138 pages of delish looking recipes and beautiful color pictures. They all appear to be 100% compliant. I do not have a slow cooker but I do have a crock pot and will alter the cooking as necessary. I hope everyone is enjoying lucky day 13! I had ground turkey with onions with spinach and kalamata olives for breakfast. I got home in time to whip up lunch, glad I had hard boiled eggs in the fridge so I made deviled eggs and snap peas for lunch. I've been looking over my produce habits and notice I've been starchy-veg dominant lately so I'm going to change up my produce order to cut back on starchy veggies and add more greens. My change probably won't take effect until a week from tomorrow though. Allergies limit me on some things and I think I just fell into what was easy among the safe options. Speaking of allergies, I'm facing growing concern that I'm sensitive to coconut. I suspected it before and stayed away for a while. It seemed okay when I tried again but now that I'm having it regularly again for this Whole30 I think I'm noticing the same strange feeling in my throat and mouth and continue to have bloating. I might just finish off what's in my fridge and then do the rest of this Whole30 without it, possibly extending it if necessary to see if that's really a problem for me. I am dreading to find out to be honest. I'm already allergic to avocado so my healthy fat choices are looking slim. @Ginsky I know you may not be familiar with the blood type work Dr. D'Amato has done but briefly I will tell you as Type A I cannot have any type of olives, coconut, beef, dairy, and a host of others off a list of thousands. He has it well organized if you happen to know your blood type. I find it refines this whole process, although I admit I have returned to a few no-no's on Whole30 just to see. Sure enough, they have given me problems. I only mention this because I see you eat olives at nearly every meal. I am using ghee at nearly every meal. I can have avocados but perfect and fresh is hard to come by, at least here. Good luck, I don't miss a lot of these things but one thing I do miss is cheese. I also had a June 1st start date! I just joined the forums yesterday and only now just found this topic - it is great to see so many people embarking together! Day 13 is a drastic improvement over the last several days; Days 7 and 8 I was in full on KILL ALL THE THINGS mode followed by a couple days of depression. Added more sweet potato into my daily routine and my mood is much improved, although I am a bit tired today after lunch. I have been struggling with meal timing, and I think I need to add a mini meal for the end of the workday since I prefer a later dinner... and I should stop eating fruit as a 4pm snack. the great thing is I haven't been craving anything off-plan and have been really satisfied overall with eating, and while my bank account is weeping at the money spent on groceries I keep reminding it that I am still spending less than when I was eating out.... a lot. Funny of perspective is! Looking forward to my crockpot pot roast tonight. I haven't cooked red meat in forever so it will be an interesting endeavor! I survived my first dinner out!!! Feeling beyond proud! Today is our 2nd wedding anniversary and we had booked a table before I committed to whole30 for a restaurant where we had a voucher for a deal - 50% off chateaubriand for two. I was so nervous that there would be non-compliant food that couldn't be swapped but it turned out not to be an issue at all! The waitress was great and really understanding. I'm not going to lie, this afternoon I had decided I was going to allow myself to cheat and eat the hand-cut chips (french fries) but once we were there I felt totally empowered to choose not to have them and honestly I didn't feel I had missed out and I enjoyed my meal just as much if not more cause I felt so proud of myself. The salad had sweetcorn in it but it was easy to pick out. All in all, it was a total success and a lovely evening. Made extra lovely by fitting in a dress I haven't been able to wear for 5 years. I decided to try it on just to see and didn't expect it to zip up. The surprise and joy when it not only zipped but easily so! Literally Whole30 is changing my life! Can't believe we are already at day 13! I thought this would be the longest month of my life, Its hard to believe how quickly time is ticking by! Wanted to offer a food tip. Im making grilled hamburger with portabella bun and grilled veggies and I REALLY wanted some ketchup but the "official" whole30 recipe didnt appeal to me so I took to Pinterest and found Ryan Wilder’s Wicked Easy Paleo Ketchup just got done making it (I added a bay leaf while cooking and salt at the end) and omg so good just like store bought but healthy. Have a question for those of you who are active/exercise. How important is it to add an extra meal after exercise? I'm trying to be less sedentary which for now is swimming and pool exercises in the late morning/early afternoon a few times a week. I'm eating a starchy veg for breakfast and lunch but havent added an extra meal, although I definitely ate more for lunch then normal. I typically eat breakfast around 10:30-11 and lunch at 2:30-3. Im at the pool from around 11:30-2 and swimming/exercising most of that time. So...when do I eat a small meal or snack? Or am I totally over thinking this and Im fine to just continue with a more carb heavy breakfast and larger lunch those days? Happy anniversary, and congrats on a successful night! I especially like that while you gave yourself permission to cheat you didn't even want to - that is some amazing commitment to yourself! Keep up the great work! I am just getting "off the couch" so to speak activity wise, so I haven't had to experiment much with an added meal yet for exercise recovery. From what I remember, I think ISWF did mention pre and post workout meals but I do not have the book handy right now to consult. I would probably listen to your body and go with what hunger cues you feel though. I say no way. Stick it back in the fridge or cook it in the oven right away. It takes some doing to spoil fresh meat. The hot roasting will kill any early inklings of bacteria. You can tell by the smell. It should be fine. @Jane3797, thank you. I have read about blood type, interesting stuff. This is something that follows my use of coconut and has never fluctuated or changed with my use or abstinence of olives. Thanks goodness for small favors, right? Hello, @kalsjourney, glad to see you. I second the advice not to throw away that meat! I've done things like that before and it's always been fine. I just made chicken wings for dinner, an excuse to use my dump ranch, still have more left. I made zucchini with basil and lemon. Today has been weird, I'm not thrilled about my thoughts on coconut but am pretty sure tomorrow will be my last day of using it. I just can't bring myself to throw away what's still in the fridge since even if it's doing something, it's not threatening my life or immediate safety. It can wait a day and I sure would be annoyed with myself for wasting food and money if it turns out not to be a problem. Great work on your Day 13! Again, I appreciate being welcomed here, even though I'm a few days behind you all. I had some people respond to my 1st day thread, who also started on June 8th, but those few folks have been fully MIA over the past 4 days. I appreciate all the activity, successes, and support happening on this thread! @Ginsky, sorry to hear about the new development regarding coconut, that's a hard one on Whole30, I can imagine. And I totally feel you about not wasting food, I'm the same way. I think that's why I've not been using a lot of the recipes in the book quite yet because I often buy what is on sale and in season at the Farmer's Market and elsewhere, rather than buying ingredients just for a recipe - and then I make up my own meals from what I have. The good news is, admittedly, I very often didn't use up the produce I would buy (a big red flag that I actually wasn't eating enough veggies) but not surprisingly, I'm running out of my veggies this week very quickly - I'm happy that I'm not in that pattern of buying all the veggies thinking "I'm gonna eat so healthy this week!" and then not eat the veggies and then have to throw away all the veggies... Yay for the win on many levels! @kalsjourney, I'm with the others - cook it up! But yeah, I've done that before and it's a bit demoralizing, I know. @HopingtoHeal - Happy anniversary and congrats on getting through the dinner in a healthy way. As for me: OMG - the carb flu is real. I'm on Day 6 and I wasn't feeling any of the symptoms outlined in the book - Until.Today. I felt like I had a fever and could hardly stay upright. Thankfully, today was a work from home day - I took a midday nap (which the book totally predicts for Days 6 - 7). But not so thankfully, I didn't get the work done that I needed to, but will try a go at finishing the work tonight. Tomorrow is a day I'll be out from 8am - 8pm. I'm a little worried since I had a long day out yesterday and didn't prepare (I know, my bad) and found myself ravenous and relying too much on fruit and Larabars (the only things on protocol available where I was at). I didn't go off protocol, but it wasn't an ideal eating day. So, tonight I'll be cooking meals for tomorrow and have written it all out - and will bring a cooler in the trunk with my goods. I hope I don't feel as carb flu-like and exhausted tomorrow, since it will be a heavy work day. @Jane3797 @Ginsky @Heather_r: Thank you all so much for chiming in (and telling me what I wanted to hear)! As soon as I realized my error, I put it in the fridge where it shall sit overnight... I plugged in my crockpot so tomorrow morning I do not have a repeat. 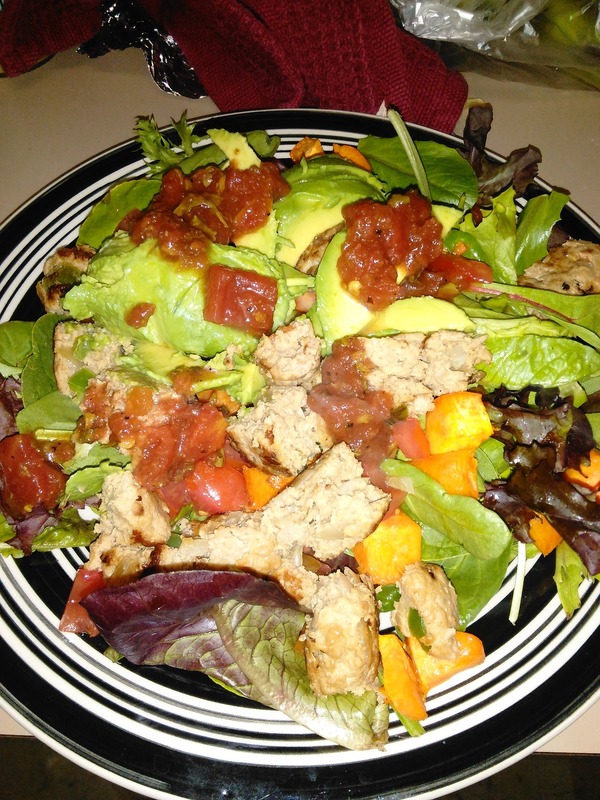 My dinner wound up being a salad of sorts: mixed greens, couple vine ripened tomatoes, roasted sweet potato, an avocado, a jalepeno turkey burger cut up and a touch of salsa. It was actually really good (so good I may have had a second of those burgers... which I am paying for now as I am overstuffed. sigh) but I am still kind of bitter about the crockpot situation. Heather, the carb flu was gnarly! The month prior to starting my Whole30 I was essentially on a liquid/soft food diet to some medical crud, and I started eating solid food again a few days before June started... so I figured it was the perfect time to commit to this! Little did I know the puddings and ice cream and meal replacement shakes would cause an unknowing sugar crash that lasted for like 10 days. It was awful, but on the other side it is mostly good! Stick with it and good luck with your meal prep + long day tomorrow! @kalsjourney , this looks delicious! Instead of making lemonade from lemons, as they say, you made up for your lost crockpot meal with something that looks real delicious! But, yeah, I get the bitterness about the crockpot ordeal, lol. Second day in a row I made it to the morning spin class! Was able to do a double yesterday and will be doing another double today and I am loving it. My calves started to cramp up a little at the end of last night's class so I made sure to eat a giant banana after this morning's class. I am feeling great, my mood is up and I am once again enthusiastic about Whole30. The weekend was kind of rough but I knew it would be so I was prepared. I reactivated my membership at BJs for the express purpose of buying avocados that weren't $2.50 a piece. Picked up a giant container of mushrooms, more spinach, more kale, and more collards. My fridge is jam packed with fresh veggies and I am looking forward to emptying it over the next few days. The only issue that persists is the sleep thing. I am waking up multiple times at night and I am pretty sleep right now, planning to go to bed at dark with no TV tonight and just see how it goes, maybe after a bath. Yesterday was my third dose of Natural Calm and the negative side effect has passed, hopefully I will be feeling more of the positive side effect (sleep) tonight. Elevated moods can make it hard for me to sleep, so I know this isn't just caused by the diet, but any tips would be appreciated. I will be starting June 19th. My husband and I are going on a mission trip at the end of July so I am looking forward to this new food challenge. I view this as a lifestyle change to nurture and care for my body with fresh and wholesome foods. I am ready to embrace this and kick-start my health and well-being.